Shadow Pictures Ltd - 82 min. Cast: Taika Waititi, Jemaine Clement, Jonathan Brugh, Cori Gonzalez Macuer, Stuart Rutherford, Jackie Van Beek, Ben Fransham, Elena Stejko, Jason Hoyte. 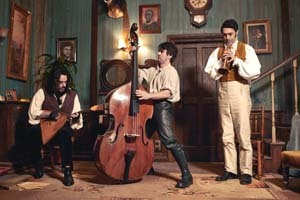 Crew: Screenplay: Taika Waititi, Jemaine Clement; Directors of Photography: Richard Bluck, D J Stipsen; Editors: Jonno Woodford-Robinson, Yana Gorskaya, Tom Eagles; Original Music: Plan 9; Production Designer: Ra Vincent; Costume Designer: Amanda Neale; Makeup & Hair Design: Danelle Satherley; Visual Effects Supervisor: Stan Alley; Producers: Emanuel Michael, Taika Waititi, Chelsea Winstanley; Directors: Taika Waititi, Jemaine Clement. This is a horror comedy about four vampires who are trying to get by in modern New Zealand. They are flatmates with the usual problems of rent, housework and trying to get along. When 8000 year old 'Petyr' turns a 20-something 'Nick" into a vampire, the rest of the guys do their best to "teach him the ropes" and guide him through his now life. In turn, 'Nick' tries to teach the others about modern society fashions, technology and even the internet. When 'Nick' introduces them to his friend 'Stu', that changes the vampire's "lives" and attitudes. So when Stu's life is threatened, they all decide that maybe humans are worth fighting for. Again, subtitles would have been helpful, as some of the dialogue was difficult to understand. I ended up wishing that the producers had taken the "alternative universe" approach, such as that used with 'Perfect Creature', except to make it comedic. Starting 26 November 2014, a PAL R0 dvd can be purchased from NZ sources for about $35nz. It is presented in its original 1:78:1 format with a DD Surround 5.1 English language track. There are no subtitles. DVD extras include: 'Behind the Shadows'(17:32), 6 Character Interviews(18:35), 12 deleted scenes(31:22), 10 video extras(27:25) and 6 Promo Videos(6:34), Trailer(2:24), poster gallery and still photo album. Additionally there is a "Limited Edition" 16 page printed mini scrapbook included within the box. Starting 07 January 2015, a single disc PAL R4 dvd ($20-25au) and a single disc Region B Blu-ray ($25-30au) was released in Australia. These offerings do not contain the extras contained in the forementioned NZ DVD. The Blu-ray is 1080p with a DTS-HD Master 5.1 English language track, but no subtitles. It does contain the trailer as well as four other unrelated trailers. Starting 05 March 2015, a single DVD or a single Blu-ray can be purchased from New Zealand resellers for about $35nz. A three disc set, containing Blu-ray and DVD versions of the movie, plus another DVD that contains 2 hours of extras (the same extras as those listed above), is scheduled for a 11 March 2015 Australian release, selling for about $35au. Starting 13 April 2015, it is available from UK resellers. The DVD is pre-selling for under 20#, the Blu-ray for under 25#. Canada is scheduled to start offering DVD and Blu-ray discs 26 May 2015, selling for about $20 and $30 respectively. Starting 05 June 2015, DVD and Blu-ray German versions are available, selling for 16-20eur. US resellers have DVD and Blu-ray copies available for $20-30us, starting 21 July 2015. The extras listed in the first NZ offerings, listed above, are included. Additionally there is an optional audio commentary track with Jemaine Clement and Taika Waititi. There are also optional English and French subtitles. Starting 27 January 2016, a French version is available. 2014 - Sitges Catalonian International Film Festival - Best Feature.